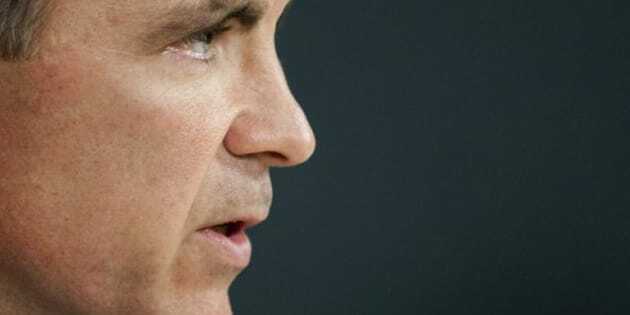 Bank of Canada governor Mark Carney could look to raise interest rates if excessive borrowing by Canadian consumers and companies risks hurting the economy. In a speech in New York, Carney said Friday that low interest rates over a prolonged period can cloud financial judgments and prompt companies and people to borrow too much for too long. But, he said the central bank's inflation-fighting policy framework allows flexibility to address such worries. While the first line of defence against a buildup of consumer and corporate debt is regulation and supervision of the banking and credit industries, Carney said interest rate policy can also be used. "Monetary policy has a broad influence on financial markets and on the leverage of financial institutions that cannot be avoided,'' Carney said in his speech. Carney noted that Canadian banks are reinforcing their balance sheets to meet new international rules ahead of schedule and the federal government has tightened home mortgage financing rules to help prevent consumers from borrowing more than they can handle. However, the Bank of Canada warned earlier this week that Canadians -- with higher mortgage debt linked to rising house prices in many markets -- are becoming increasingly vulnerable to a housing slump. The bank did not suggest a U.S.-style housing collapse for Canada, but noted that home prices have risen sharply in the past dozen or so years along with debt, as homebuyers have needed both bigger mortgages to buy homes and used equity from higher home values to finance other purchases. The central bank has calculated that a 10 per cent drop in home prices could generate a one per cent decline in consumption, which would slow economic growth. Carney's speech came ahead of a meeting of G20 finance ministers and central bank governors scheduled for the weekend where they are expected to focus on promoting global economic stability and growth. The central bank recently completed a review of its monetary policy framework and reaffirmed its position on annual inflation targets of two per cent, within a broad range of one to three per cent. Under its framework, the bank aims to return inflation to a medium-term target while limiting volatility in other areas in the economy. However, Carney noted that flexibility in the time it takes to return inflation to the target rate cannot be arbitrary and needs a clear and transparent approach. The U.S. Federal Reserve has said that its fed funds rate is expected to remain at exceptionally low levels at least through late 2014. "Extraordinary forward policy guidance within a flexible IT framework helped the Bank of Canada provide additional stimulus when it was needed and should help the Fed do the same. The Fed's experience with a published interest rate path in conventional times, when they return, is something we will watch with interest,'' Carney said. The Bank of Canada's key overnight rate has been set at one per cent for more than a year. Inflation edged up in January to 2.5 per cent, boosted by an increase in gasoline prices. However, the underlying core inflation rate _ which excludes volatile items such as some fresh food and gas _ rose to 2.1 per cent, one tick higher than the Bank of Canada's target.